Amy pictured at a recent GTS. In June 2002 (so exactly ten years ago), I was diagnosed with Stage IV Hodgkin’s Lymphoma. I initially went to my primary doctor because I thought I had the flu. It took over six weeks and a TON of appointments with different specialists and dozens and dozens of different tests to figure out that I had Hodgkin’s Lymphoma. Honestly, the ‘not-knowing’ seemed much worse than actually hearing the diagnosis. Plus, I was really sick from the cancer – I had lost a lot of weight for no reason, had terrible night sweats and was horribly exhausted. Without a doubt, though, the worst symptom was the itching. It literally felt like my bones itched, and no lotion, medicine, nothing relieved it. However, my oncologist told me two things that first day that kept me from falling apart when he told me I had cancer. The first was that Hodgkin’s was one of the most treatable cancers of all and that the survival rate for someone (even in Stage IV) was very good. And, second, that the treatment protocol would actually relieve some of the symptoms I was having. And, that while the chemo and radiation would have their own side effects, I could expect to feel a lot better within my first two treatments. Two days after I got my diagnosis, I had my first chemotherapy treatment. And, by the end of the first month, the itching, night sweats and all the other symptoms were gone. And, I had a new hat collection. Ultimately, I had six months of chemotherapy and 21 radiation treatments. Near the end of chemotherapy I had to meet with a bone marrow transplant specialist, but fortunately the chemo and radiation worked and I was able to avoid a transplant. In March 2003, Dr. Saker, my oncologist, told me I was in remission. I’ve gone back every year and am happy to report I’ve been in remission for over 9 years now. I first got involved with The Leukemia & Lymphoma Society during this time. When I was first diagnosed, I scoured the internet for information. The most helpful source for me was LLS. They had literally every answer I wanted or needed to know. Plus a lot of new things I hadn’t even thought to ask. My oncologist was absolutely amazing, but having a second resource with LLS was so comforting. When I was a few weeks into my chemo treatments, my colleagues at work (I worked for a small division of Philips Electronics at the time) asked me if they could put a team together to participate in The Leukemia & Lymphoma Society’s Light the Night Walk in my honor. Of course, I was honored and humbled and said yes. Except that they set a very lofty goal to raise $10,000. I thought they were crazy, but really enjoyed the whole spirit of the season. One of my favorite memories from that time was the day that they held the final event at work before the walk. It was a day where they were going to let all of us know how much we’d raised. I walked in that morning to find that everyone (EVERYONE) at work was wearing a hat. (After I lost my hair, I couldn’t get the hang of wigs, so I only wore one once and switched to hats immediately.) Anyway, everyone, including the Division CEO, was wearing a hat that day. It still humbles me and makes me tear up to think about it. When they announced later in the day that they’d raised not $10,000, but $30,000, I was so overwhelmed. We had a blast at the LTN walk. And, again, it’s still one of my favorite memories. Several years later, the year that I turned 40, I decided it was time to check “run a marathon” off my bucket list. Since I’m a terrible runner, and because I’ve always supported other Team In Training runners, I signed up with the Virtual Team In Training to run the 2010 Rock 'n' Roll Seattle Marathon. I had a blast, and even though I had expected to check it off my list and move on to the next thing, the minute I crossed the finish line, I knew I would do another one. Now, I work for Deloitte Consulting, and Deloitte has TNT teams all over the country at its various locations. And, during the Fall 2012 season, Deloitte expects to cross the million dollar mark with TNT – meaning, Deloitte TNT’ers will have raised a total of more than $1,000,000 by the Fall races for LLS. (We’re at over $950,000 right now.) So, I signed up with the Deloitte Fall team and couldn’t resist the Nike Women’s Marathon in San Francisco. Who can resist getting a Tiffany necklace from a California firefighter after a 26-mile run? I’m so grateful to be a survivor. I’m grateful to my doctors, my friend, my family. And, I’m so grateful that there is an organization like The Leukemia & Lymphoma Society that works to support people who are in the position I was in 10 years ago, but that also works to fund research to eliminate the need for it. Amy Reeves Cosgrove is currently training with Team In Training for this Fall's Nike women's Marathon. Amy is a Human Capital Manager with Deloitte Consulting. Originally from Thomasville in South Georgia, she's been in the Atlanta area for more than 20 years. What a gorgeous morning for a triathlon! This was the view from the Pro start to St. Anthony's Triathlon. We still had almost 2 hours to wait for our start. In fact, the first winner was coming across the finish line when we finally lined up in the water. We had a good time hanging out, warming up, and thinking about the swim to come. It was so nice to have a large team there to do it with, especially people we’ve gotten to know and train with for the past 6 months. Training with Team In Training has been a wonderful experience. 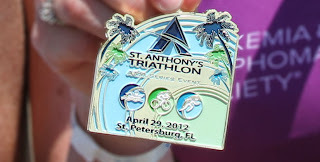 I raised $2,800 for St. Anthony’s and over $11,000 since last May to help fight blood cancers. I am extremely proud of that and will cherish the people I have met along the way. Aaah, the dreaded swim. 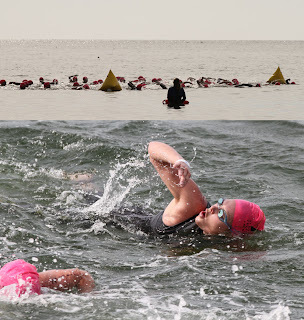 This was my first swim of this distance in the open water and my first salt water swim. In fact, I really have never swam before a year ago when I started with Team In Training. You can pretty much tell from my lovely form but I am proud to say I finished 10 minutes faster than I thought I would. That, my friend, is victory right there, even if it still took me 37 minutes to go .9 mile. The water got a bit choppy when you headed away from shore and my wetsuit practically rubbed a hole behind my ear, but I survived. Yeah! This is our wave starting and Tim found me in the water and got a nice closeup. Not sure if that is good or bad. In my mind, I look fierce. I was just glad to be out of the water in the first picture, I was doing okay in the second picture but the run…oh the run…it was so hot by the time we got to the run I am smiling because it is over. I trained pretty well for this run and I finished far more slowly than my Nation’s run. I blame it squarely on the 85 degree weather and the late start. I am just happy to be done! We did it! We earned our finisher medal. After training since November, it was nice to be successfully across the finish line! 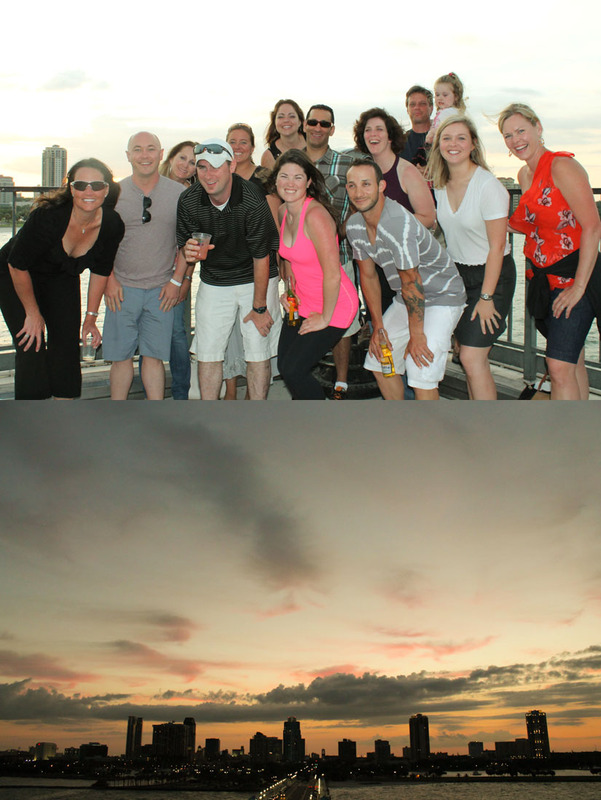 After a hard day’s work, we took some time to celebrate our race, our fundraising, and our new friendships. This is part (but not all) of our Spring 2010 Georgia Tri Team. We were overlooking the city of St. Petersburg from a fun little place called Cha-Cha Coconuts. Andrea Ferenchik is an Account Manager with Microsoft whose corporate team raised over $100,000 this season for The Leukemia & Lymphoma Society. Andrea became interested in Team In Training in order to reach a personal goal but has since seen the incredible impact her fundraising is having on finding a cure for cancer. She has honored her neighbor Lori’s husband who passed away in 1988 from Leukemia and is currently fundraising in honor of Grayson, a beautiful 6 year old boy battling Leukemia as we speak. 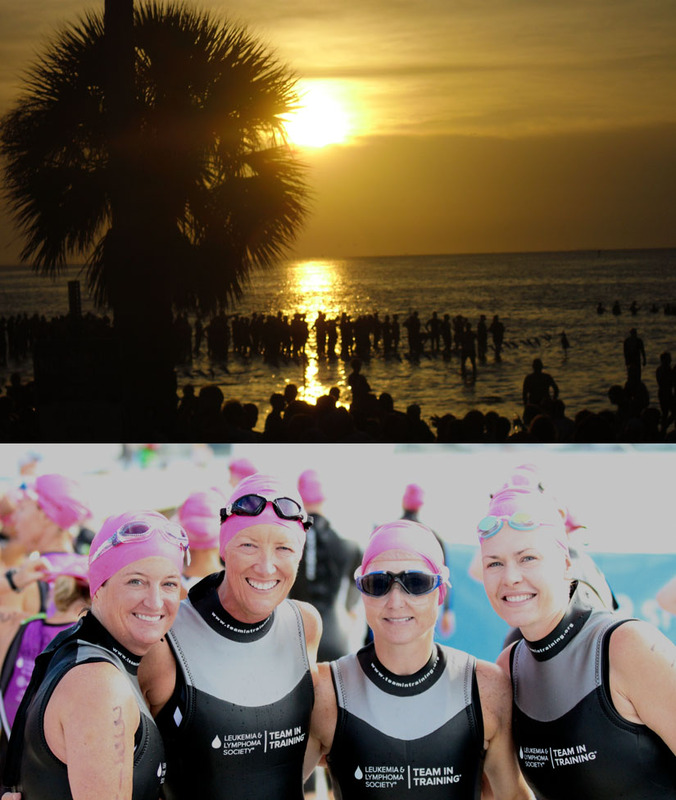 She has just lost her mind and signed up for Augusta 70.3 this September…Go Team!